Saturday morning began with formation and drills. After about two hours, I was able to mentally grasp the basics of marching and maneuvering in tight ranks. Yet even though the concepts were clear, it was obvious that a certain amount of time would be required for the physical motions to become second nature. As a result, marching and maneuvering did not get easier as the weekend progressed. Every motion demanded and act concentration and focus. Missteps effected everyone in close proximity. Even marching in a straight line proved to be a struggle as I found myself shuffling in order to step on the correct foot and avoid kicking the person in front of me. By the close of the weekend I figured my brain was just wired to walk in the opposite manner of most people. I was sore from locking my body straight and shuffling my feet to find the correct footwork. Unfortunately, my familiarity with group choreography did little good in formations this tight. I did my best to cope by learning to follow the rhythm of the marching drum and take it as they say, one step at a time. The others in the troop kept me in line as well, repeatedly reminding me to assume ‘trail arms’ when I was busy concentrating on walking. 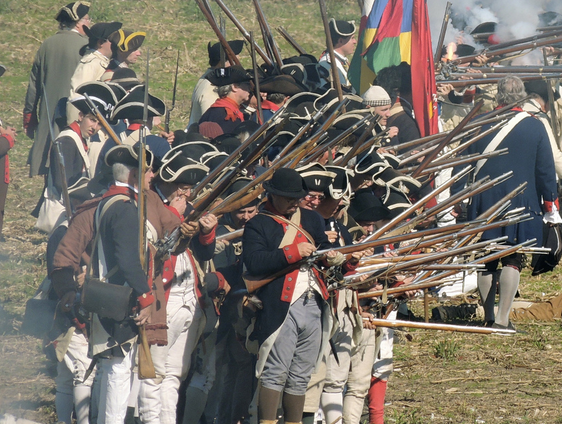 Formation drills drove home the importance of maneuvering during the 18th century. Unit cohesion, battlefield mobility, and concentrated fire was the ultimate goal. 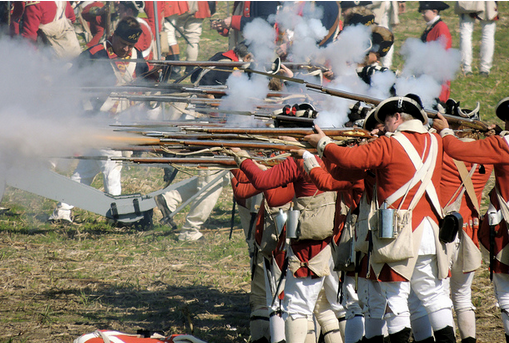 These tight formations had but one primary goal– to maximize the effectiveness of the musket. For those familiar with modern day firearms, safety etiquette requires that proper distance from another person be observed when discharging a firearm. Only an accident or a joke in poor taste would result in discharging a firearm a few inches away from other person. 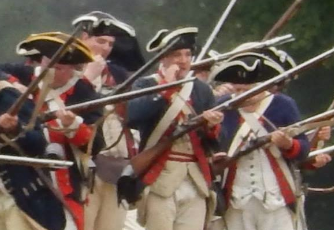 18th century reenactment offers an entirely different experience. Firing and reloading shoulder to shoulder was a requirement for a soldier of the line. If you happened to be a bit taller than your comrades, you would be positioned in the second row where you were expected to fire OVER the shoulder of the man in front of you. This type of firing was a unique experience, and one that I recommend if you are a fan of firearms. It is the only real way to experience the combat effectiveness of the musket. Firing as a concentrated mass becomes less a single act of an individual and more of a coordinated action of a larger whole. For someone living within the context of a highly individualistic 21st century mindset, this is truly a step into the past. In short, the unit becomes a collective fire-breathing, smoke spitting, shotgun blast. It is easy to understand how a well drilled foot unit can be the most effective and powerful weapon on the battlefield. However, effectiveness like this takes training. Now I understand why troops drilled 40 hours a week. I consider myself somewhat competent at loading and firing my musket, yet during the chaos of a “battle” I often behaved like a rank novice. I found myself reloading my musket using all sorts of improvised motions. While firing and reloading in close quarters, there is a great deal to keep in mind. The musket must always be pointed away from others (until firing at an enemy unit). The torso cannot be tilted as it would interfere with the man next to you (watch those elbows!) Most importantly, if you were in the back row, you had to make sure you did NOT step too far away from the row in front of you. This mistake would result in the the muzzle discharging too close to faces and ears. The pressure to reload and fire on command was palpable when facing a wall of enemy troops trying to do the same a few short yards away. I will not pretend to understand what sort of emotions soldiers experienced during an 18th century battle (or for any battle for that matter) but I can understand to some degree the difficulty involved in maneuvering and firing in the mists of a noisy, smokey and chaotic environment. Only the muscle memory acquired from constant drilling could alleviate the pressure and chaos that interferes with the smooth operation of a musket. Now I understand why they drill…and drill…and drill. The importance Baron Von Steuben cannot be underestimated. Up next I learn why a good flint makes all the difference in the first Battle of the Hook! Yes an idol soldier could only mean no good. Speaking of uniforms and musicians, the Continental musicians dressed in red in order to separate themselves from the troops of the line. They looked like they were in the wrong army! A fascinating and educational post! Your points on the difficulty of drill and the value of training give a better appreciation of the Continental soldier’s world. I envy your experience and your insight.